The development of innovative drugs in areas of need is risky and expensive for drug companies compared with modifying existing compounds to create “me too” drugs. Most new drugs fall into the second category,1 and the NHS spends billions of pounds each year on them, even though they often have little or no incremental value over alternative agents. Effectively, the NHS is rewarding the drug industry for poor investment and creating a disincentive for risk taking and genuine innovation. When resources are limited, giving one patient an expensive drug with no added value when cheaper alternatives exist stops other patients getting treatments they need. In the top 10 prescribed drug classes by cost, over £3bn was spent in England alone on branded drugs where in most cases equally effective low cost generic alternatives are available.2 By contrast, new innovative drugs approved by NICE between 1999 and 2004 added £800m a year to the UK drugs bill. This is money well spent especially if they are first in class drugs acting on newly discovered biological pathways in areas of unmet need.3 However, only a fifth of all new drugs brought to market offer any advantage over existing therapies.1 Furthermore, drug companies spend three times more on marketing (much on “me too” drugs) than on research.4 Society should explicitly and preferentially redirect funding towards important but riskier research and development. The total annual saving of a concerted NHS campaign to use the most cost effective medicines could be more than £1bn a year (table 1⇓). A more pragmatic switching rate of 50% would save £500m a year and would preserve doctor-patient prescribing choice and autonomy. Even when generic switching does take place, it is often started too late to realise maximum savings, as the following two examples show. After the patent on simvastatin expired in England and evidence that it is therapeutically indistinguishable from atorvastatin was highlighted,5 6 national programmes were started to switch patients from atorvastatin 10 mg or 20 mg to simvastatin 40 mg. The use of atorvastatin 10 mg halved in three years (from 5.6 million prescriptions in 2006 to 2.9 million in 2009),2 with an expected saving of £1bn (€1.2bn; $1.6bn) by the time atorvastatin’s patent expires in November 2011. However, because the initiative did not start until after the patent had expired, and less than half of patients were switched, only half of the possible maximum saving has been realised, and £175m a year is still spent on low dose atorvastatin where simvastatin 40 mg would cost £11m. However, when the atorvastatin patent expires, high dose atorvastatin (40 mg and 80 mg) will become a “best buy,” and much of the annual expenditure of £124m on rosuvastatin and ezetimibe will be wasteful by comparison. At University College London Hospital, the Use of Medicines Committee considers losartan to be all but clinically indistinguishable from other angiotensin receptor blockers (box 1). All other angiotensin receptor blockers have been removed from the formulary, and a pharmacist led drug substitution policy is being implemented.8 All admitted patients who are taking an angiotensin receptor blocker for hypertension are automatically switched to losartan unless they have known intolerance, which is rare. Anyone who is taking an angiotensin receptor blocker for heart failure at less than the maximum dose is switched to losartan and the dose increased incrementally, aiming for 150 mg/day. Similar switching programmes are already being proposed or enacted in other trusts, primary care trusts, and internationally,9 but every month that passes before any national implementation equates to an unrecoverable £20m lost opportunity. Angiotensin receptor blockers are a group of seven once daily oral drugs for heart failure and hypertension. Olmesartan and candesartan are slightly more effective than losartan but each incremental mm Hg reduction beyond that of losartan costs 11-40 times more. The two cases above are just selected examples of prescribing that have been subject to retrospective fixes—that is, once funds have already been wasted. But these scenarios are ubiquitous in modern medicine. Generic drugs have often been shown to be therapeutically equivalent yet many times more cost effective than some newer, branded therapies.3 17 Once a drug’s patent protection expires the price can tumble overnight but the clinical effectiveness remains the same. Having a choice of two, three, or four drugs in a class is useful for the varied and rich scenarios in medicine but to have seven angiotensin receptor blockers and 14 angiotensin converting enzyme inhibitors developed and brought to market (let alone the others that nearly made it) represents bad investment and enormous hidden waste at several hundred million pounds per drug. Generic substitution has been used with partial success in other European countries including Austria, the Netherlands, Norway, and Sweden.18 19 20 Although substitution is well accepted by patients, the process requires time and effort.6 Doctors naturally want to care for the individual rather than deliberating apparently esoteric economic concepts such as cost effectiveness and opportunity costs.21 Within the NHS the current initiatives and schemes to encourage efficient prescribing, based on the above analysis, seem to be a long way from providing the most cost effective care. This suggests that NHS drug prescribing practice could be greatly improved. Fundamental prescribing reform based on the following strands could help improve cost effectiveness. We believe that implementing these reforms could redirect roughly £1bn a year (about 10% of the total drug budget) to innovative drugs. The success of these proposals requires the recognition of a problem, deep commitment within the NHS, political support, and extensive overhaul of NHS prescribing and financial systems. All the expertise exists for implementation: NICE (with a broadened remit) and professional societies to assess switching and exceptions to the “generic first” rule; the National Prescribing Centre to implement and effect therapeutic switching by creating templates and operating procedures in collaboration with commercial entities such as ScripSwitch; local budget holders, hospitals, pharmacists and prescribing advisers for local modification of national templates; and overall supervision by the Department of Health. Statin switching has shown that the payback time for such strategies is short, sometimes as little as one month, and experience of switching exists at all levels of healthcare after more than two million patients had their statin switched. Reducing spending on medicines with no added value would free up money to spend in other areas of need and provide incentives for the drug industry to invest in the right places. There will be winners and losers, and there are hurdles to be overcome: the difficulties of reconfiguring NHS prescribing; inertia and resistance to change, and the power of some parts of the drug industry to resist such reform through threats and lobbying. However, in the long term, the increased value for money and the invigoration of new drug development will benefit us all. Contributors and sources: ASF is a clinical research fellow in cardiology. ASW is a reader in lipids and cardiometabolic disease at King’s College London and a member of NICE technology appraisal committee. AG is the formulary and medicines management pharmacist at UCLH and board member of the London Procurement Programme Medicines Management Workstream. BBG is a research fellow in pharmaceutical policy. JCM is a cardiologist and member of NICE technology appraisal committee. JCM is the guarantor. Competing interests: All authors have completed the unified competing interest form at www.icmje.org/coi_disclosure.pdf (available on request from the corresponding author) and declare no support from any organisation for the submitted work; no financial relationships with any organisation that might have an interest in the submitted work in the previous three years; and no other relationships or activities that could appear to have influenced the submitted work. Sermet C, Andrieu V, Godman B, Van Ganse E, Haycox A, Reynier JP. Ongoing pharmaceutical reforms in France: implications for key stakeholder groups. Appl Health Econ Health Policy2010;8:7-24. NHS Information Centre. Prescription cost analysis 2009, 2010. Godman B, Haycox A, Schwabe U, Joppi R, Garattini S. Having your cake and eating it. Office of Fair Trading proposal for funding new drugs to benefit patients and innovative companies. Pharmacoeconomics2008;26:91-8. Light DW. The risks of prescription drugs. Columbia University Press, 2010. Moon JC, Bogle RG. Switching statins. BMJ2006;332:1344-5. Usher-Smith J, Ramsbottom T, Pearmain H, Kirby M. Evaluation of the clinical outcomes of switching patients from atorvastatin to simvastatin and losartan to candesartan in a primary care setting: 2 years on. Int J Clin Pract2008;62:480-4. Wettermark B, Godman B, Andersson K, Gustafsson LL, Haycox A, Bertele V. Recent national and regional drug reforms in Sweden: implications for pharmaceutical companies in Europe. Pharmacoeconomics2008;26:537-50. Universtiy College London Hospital NHS Trust. UCLH guidelines on angiotensin II receptor blockers (ARBs) for hypertension and heart failure. UCLH, 2010. www.uclh.nhs.uk/NR/rdonlyres/408E7244-DCF1-4742-AAE1-9B16455C69B6/0/UCLHARBGUIDELINESFINAL.pdf. Godman B, Bucsics A, Burkhardt T, Schmitzer M, Wettermark B, Wieninger P. Initiatives to enhance renin-angiotensin prescribing efficiency in Austria: impact and implications for other countries. Expert Rev Pharmacoecon Outcomes Res2010;10:199-207. Heran BS, Wong MM, Heran IK, Wright JM. Blood pressure lowering efficacy of angiotensin receptor blockers for primary hypertension. Cochrane Database Syst Rev2008;4:CD003822. British Hypertension Society. Guidelines for the management of hypertension. BHS, 2010. Meredith P. Comparison of the efficacy of candesartan and losartan: a meta-analysis of trials in the treatment of hypertension. J Hum Hypertens2009;24:525-31. 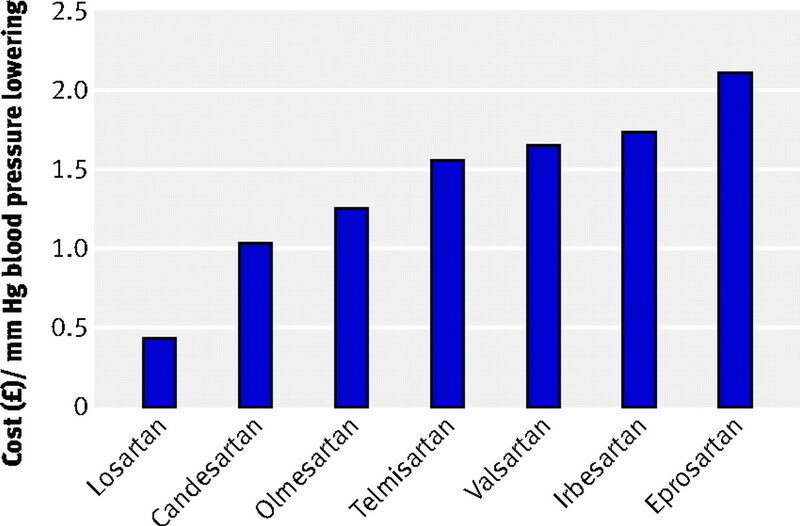 Kjeldsen SE, Stalhammar J, Hasvold P, Bodegard J, Olsson U, Russell D. Effects of losartan vs candesartan in reducing cardiovascular events in the primary treatment of hypertension. J Hum Hypertens2010;24:263-73. Erhardt LR. A review of the current evidence for the use of angiotensin-receptor blockers in chronic heart failure. Int J Clin Pract2005;59:571-8. Konstam MA, Neaton JD, Dickstein K, Drexler H, Komajda M, Martinez FA, et al. Effects of high-dose versus low-dose losartan on clinical outcomes in patients with heart failure (HEAAL study): a randomised, double-blind trial. Lancet2009;374:1840-8. McGinn D, Godman B, Lonsdale J, Way R, Wettermark B, Haycox A. Initiatives to enhance the quality and efficiency of statin and PPI prescribing in the UK: impact and implications. Expert Rev Pharmacoecon Outcomes Res2010;10:73-85. Godman B, Shrank W, Wettermark B, Andersen M, Bishop I, Burkhardt T, et al. Use of generics—a critical cost containment measure for all healthcare professionals in Europe? Pharmaceuticals2010;3:2470-94. Godman B, Burkhardt T, Bucsics A, Wettermark B, Wieninger P. Impact of recent reforms in Austria on utilization and expenditure of PPIs and lipid-lowering drugs: implications for the future. Expert Rev Pharmacoecon Outcomes Res2009;9:475-84. Sakshaug S, Furu K, Karlstad O, Ronning M, Skurtveit S. Switching statins in Norway after new reimbursement policy: a nationwide prescription study. Br J Clin Pharmacol2007;64:476-81. Gumbs PD, Verschuren WM, Souverein PC, Mantel-Teeuwisse AK, de Wit GA, de Boer A, et al. Society already achieves economic benefits from generic substitution but fails to do the same for therapeutic substitution. Br J Clin Pharmacol2007;64:680-5. Prosser H, Walley T. A qualitative study of GPs’ and PCO stakeholders’ views on the importance and influence of cost on prescribing. Soc Sci Med2005;60:1335-46.